Part of my forgiveness process regarding my ex-husband involved understanding this concept. I came to understand that he was not capable of healthy love and true intimacy. 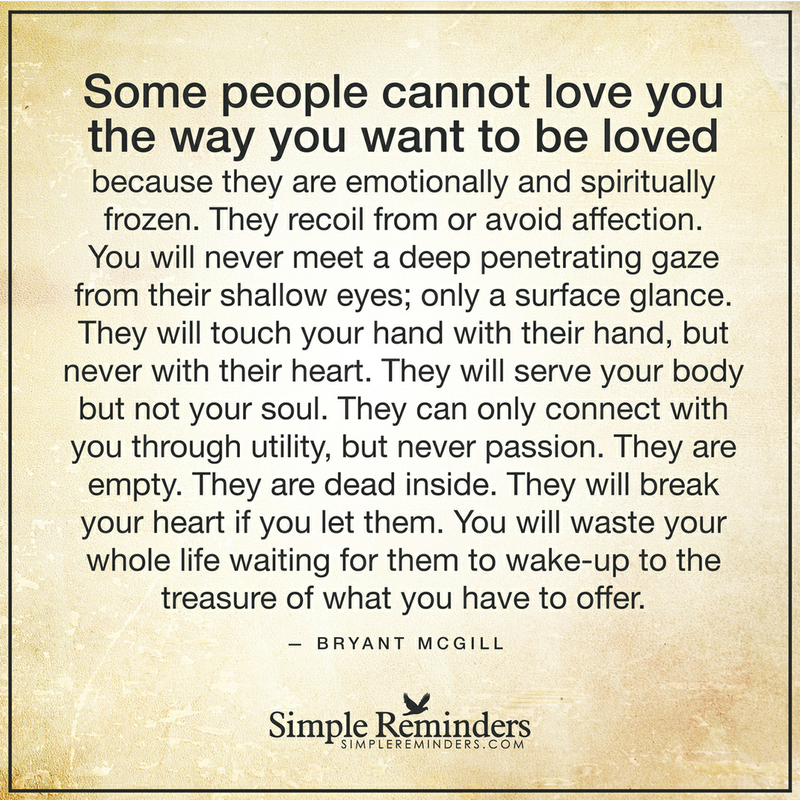 I am guessing he probably wanted to love me….and I think he did….to the extent that he could. But, I remember so often through the course of the 20 years of marriage feeling so empty and unfulfilled. I remember trying to look into his eyes or create deeper levels of connection and intimacy. …and it wouldn’t work. I used to blame myself, because I had become conditioned to believe things were almost always my fault. However, having experienced deep, intimate connection with someone I love has made it so clear to me now. There is nothing wrong with my ability to love deeply and share true and fulfilling intimacy. I have always been capable of this and have always done my part to create it. My ex-husband was not able to join me there. His woundedness runs too deep. I am sad for him about this. I actually do pray for him regularly. I do hope he will find the healing he needs. 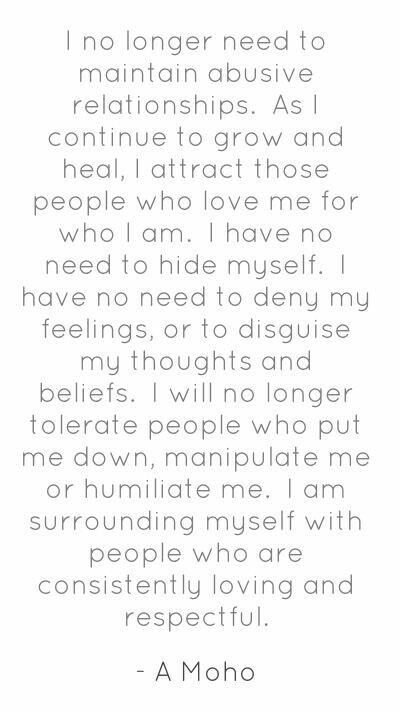 In the meantime, I am enjoying embracing who I am. …giving and receiving love and appreciating the incredible value of someone who can join me in that. It truly is a beautiful thing! It has certainly taken a long time for me to realize and embrace this truth. But, I do believe it. It has been a long, hard road in many ways to get here. And, my journey continues. 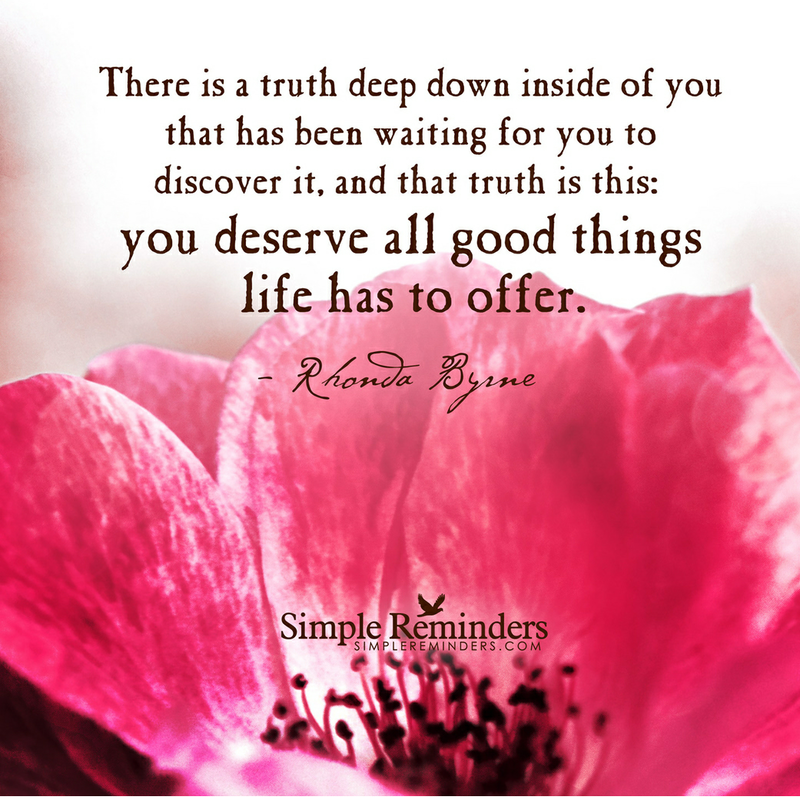 As I grow and embrace these truths, much good has come my way. My path gets smoother, straighter, and wider with each blessing I see and celebrate in my life. The people, the experiences, the lessons, the opportunities. …they all keep me moving forward on a path for my highest good. I am excited to see what my path will lead me to next! It’s interesting to me that we have the perspective that we will just get over deep loss. That’s not the way it works. Instead, the loss becomes part of us. It becomes part of the fabric of who we are. We take it in, we absorb it, and it becomes part of us. But, that’s okay. In fact, it’s a gift. But only if we allow it to be. If we allow ourselves to feel, to reflect, to learn, to grow….loss creates a deep compassion. 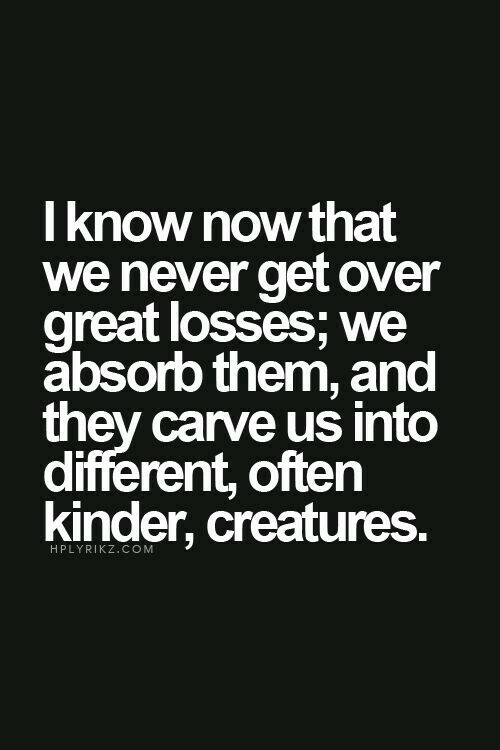 ..a strong but gentle knowing when we see loss in the eyes of another. We can respond in a way that helps heal other’s hearts, continuing our own healing at the same time. I am gratefulfor this gift. Okay, I know the truth of this. But, it still is something I try to avoid and run away from. 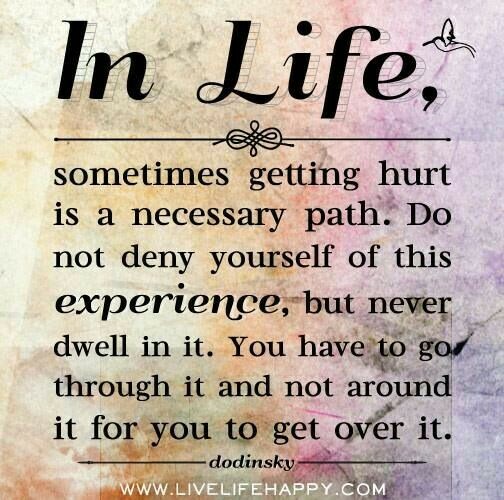 I am reminding myself that pain serves a purpose. There is something to be learned. There is growth that we would not experience without the pain. 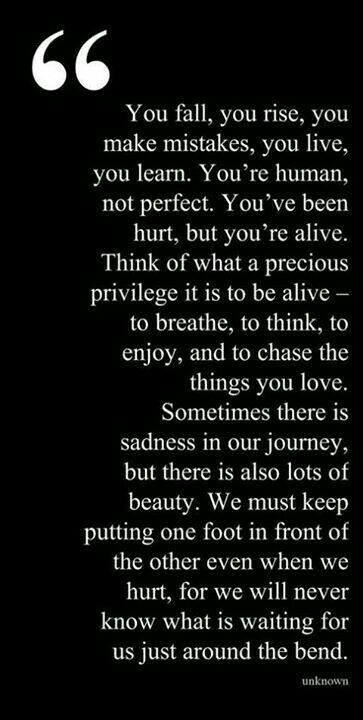 Thank you to my dear friend who spent many hours with me yesterday, allowing me a safe and loving place to go straight through some pain headlong. Because of her friendship, I could stay with it long enough to feel it and process it. 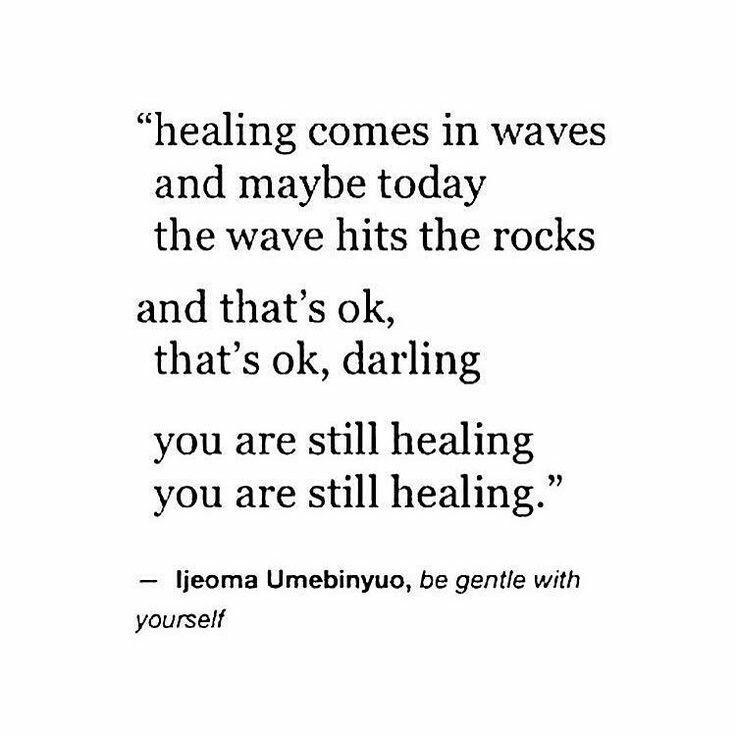 That helps me to get to the other side of it where healing is available for me. I know I am learning a lot right now, and I know there is so much growth happening for me. I know the pain is a necessary part of that. By talking about and writing about it, I can move through it and not get stuck. I can feel that happening now.